Mr. Hall's former students got together at the reception following the memorial service and sang the Burbank High Alma Mater and a barbershop song. 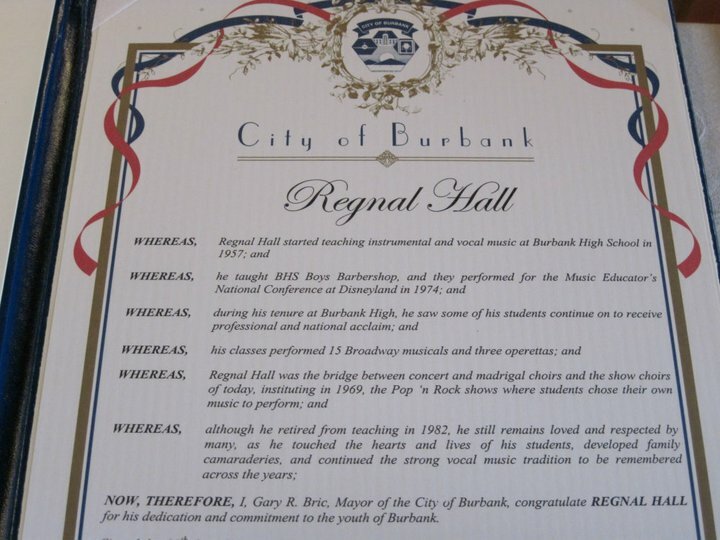 Mr. Regnal Hall taught music in Burbank for 30 years at Jordan Junior High (1952-1957) and at Burbank High (1957-1983). 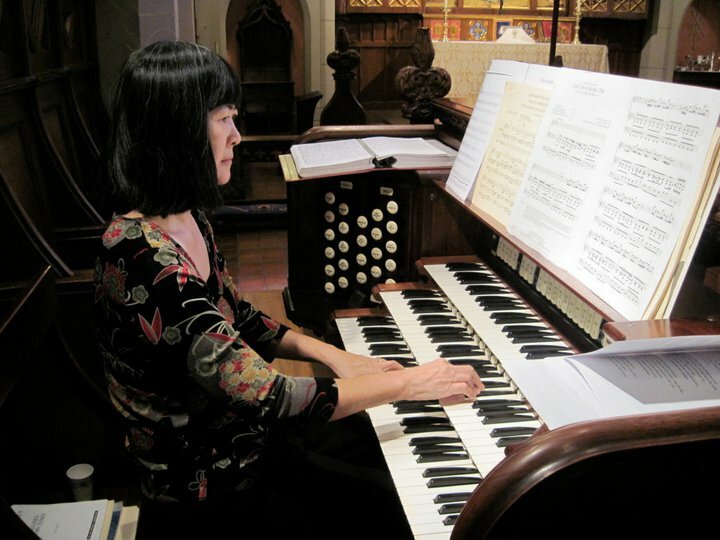 Kathy Au Crosier plays the organ at Regnal Hall's memorial service. From the Centennial book, “Regnal Hall began teaching at Burbank High in 1957. 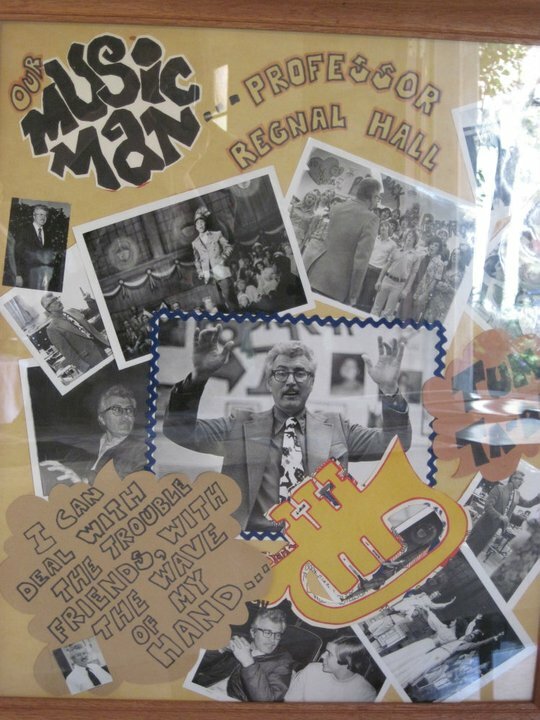 Loved and respected by many, Hall had two yearbooks dedicated to him.” From the period 1965 to 1973 there was always an Au girl involved in the music department at Burbank High, as my sisters Margo Au Ewing (class of 1970) and Doris Au MacDonald (class of 1973) also worked with Mr. Regnal Hall as accompanists and singers in the choirs. Regnal Hall citation from the city of Burbank. The interviewer for the Centennial book mixed up the quotes from myself and my sister Doris, so now I’m going to take the opportunity to set the record straight. This is what I said: “Mr. Hall had high standards, but he was open to new things. Most of the students he worked with were not musically literate so he worked on helping them learn to breathe and read music. He even had us lie down on our backs and breathe to teach us the proper way of breathing, from our diaphragms. (There was much laughter as students watched stomachs rise and fall as they breathed in and out. )” Unfortunately, my name was also mispelled drastically (see p. 105). Here’s what my sister Doris said: “He was an innovator in the show choir genre before any schools had show choirs. Songs such as ‘Puff the Magic Dragon’ by Peter, Paul and Mary, ‘Bridge Over Troubled Waters’ by Simon and Garfunkel and many songs by Bob Dylan were performed.” When Mr. Hall instituted barbershop singing in 1972, he put Doris and three of her classmates into a quartet and they performed many times at schools, antique car shows, Women’s group meetings, Rotary, and the like. After retiring from Burbank High in 1983, he worked for the Walt Disney Company until 1990. For nearly four decades he directed church choirs and composed sacred music. The music program at Burbank High is now nationally recognized for its show choirs and was in fact ranked number one in the country in 2009 and 2010. 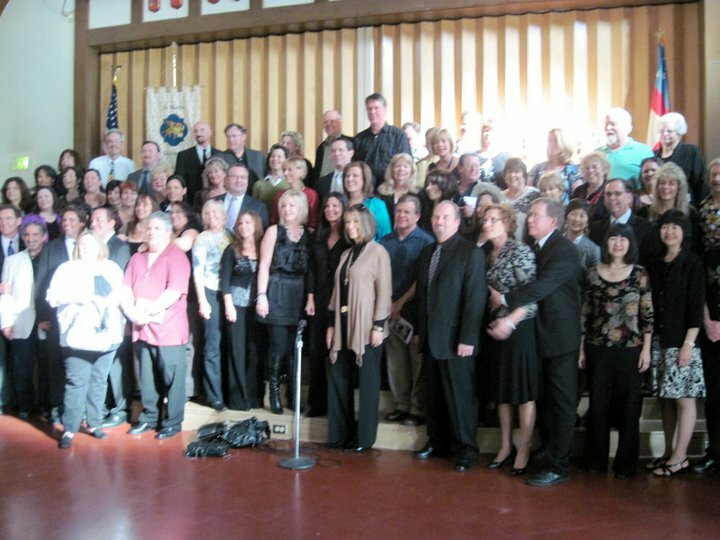 Posted by Katherine Crosier on January 2, 2012 in Burbank High School and tagged barbershop song, choral music teacher, Kathy Au, Kathy Au Crosier, Regnal Hall. Ah, Mr. Hall. What a mensch. Do they still make teachers who are this great? And didn’t you Au girls all have perfect pitch? Mr. Hall used to rave about you guys. Yes, all three Au girls have perfect pitch! All of us are still involved in music making.